What's ActiveCampaign and how do I use it? ActiveCampaign is email automation software that's incredibly easy-to-use. You can use it to set up newsletters, drip email marketing campaigns, and more. To do this, click the "Settings" option located in the left side navigation menu. The Account Settings menu will appear. Click the "Developer" option. 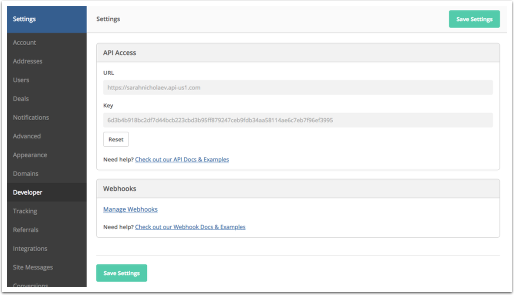 The Developer Settings page will load and will display your ActiveCampaign API URL and Key. Copy your "API Key" and URL, and add them to your Integrations page on Podia. 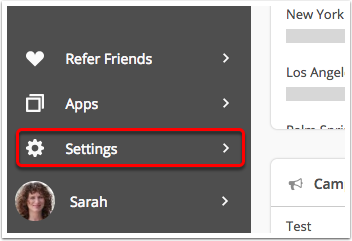 Now that you're viewing your Product, click on the "Settings" link at the top, and scroll down to the "ActiveCampaign" section. That's all there is to it! Now when people sign up for this product, they'll also be added to the chosen list in your ActiveCampaign account.